Legionella Control Internationals high performance legionella ACOP L8 Compliance Monitoring Kit has been specially developed to support those with responsibility for the control of legionella related risks in water systems. This professional standard test kit has been developed to help engineers, facilities managers and technicians monitor the health and cleanliness of their water systems, and the effectiveness of their chemical water treatment programmes to ensure compliance with the Health & Safety Executives ACOP L8 and HSG274 guidance. This professional kit will help monitor water treament parameters in accordance with the requirements set out in the Health & Safety Executives Approved Code of Practice ACOP L8 “Legionnaires’ disease: The control of legionella bacteria in water systems“, and their HSG274 Legionnaires’ disease: Technical guidance Parts 1, 2 and 3. This essential legionella compliance testing kit will help users with responsibility for water safety issues monitor the state of their safety critical water systems and the effectiveness of their chemical water treatment programmes to ensure they remain within specification and compliant with the law. Engineered water systems including hot and cold water systems and cooling water systems (including cooling towers) require careful testing and monitoring to ensure the correct water conditions are achieved and then maintained to reduce the risks associated with legionella bacteria and Legionnaires’ disease. Failure to ensure such water systems are under control can lead to a number of potentially serious problems including the formation of scale, system corrosion and the growth and proliferation of legionella bacteria and other potentially dangerous waterborne pathogens. Monitoring the effectiveness of your water treatment and system control measures is an essential task if you are to maintain compliance. Our Legionella Compliance Monitoring Kit will help you achieve this. Our Legionella Compliance Monitoring Kit has been designed around the compliance requirements set out in the Health & Safety Executives Approved Code of Practice (ACOP) L8 document “Legionnaires’ disease: The control of legionella bacteria in water systems”, and their HSG274 Legionnaires’ disease: Technical guidance Parts 1, 2 and 3. This monitoring kit is ideal for those with responsibility for the management and control of legionella risks including those appointed responsible person, health and safety managers, property owners, building maintenance managers, service engineers, water treatment contractors and facilities managers. 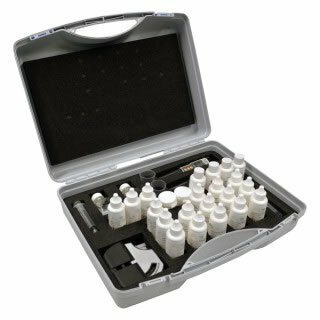 Our legionella compliance test kit is presented in its own robust carry-case and includes all the analysis equipment and chemical reagents necessary to perform between 50 and 100 individual tests, allowing users to effectively monitor system water conditions for specification compliance. Replacement reagents and other consumable components are available from us.